In our many years of working in the industry we have built strong relationships with treadmill dealers across the country. As such we able to get our visitors great deals on new treadmills as well as other home exercise equipment. 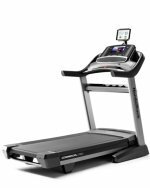 Most of the lower and mid-range models are available for sale online, but as far as the higher end treadmills like those from Landice, SportsArt, Body Solid and others, you're much better off going with a local dealer to get the very best price. If you're in the market for a high end treadmill for your home or gym, let us help you get the very best deal possible. Just enter your information below and we will have a dealer near you contact you to go over all of your options and help you choose the best treadmill at the best price. Provide any additional info, e.g. model, budget, type, etc.